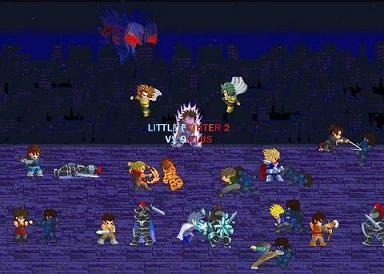 Little Fighter 2 is funny fighting game which features small puppets fighting on the streets. Fight with your hands and feet or with weapons, and use your characters special abilities and techniques. Each character has its own cons and pro's. Up to 8 fighters can fight on the screen at one time, with a maximum of 4 human players. Choose from over 10 characters each with a number of special techniques. The game features nice graphics and sound effects, joystick support, and online support for multiplayer games. In this game you will feel like you are back in the good old time of big arcade computers in playhalls.